Our centre is equipped with the Game Ready System which is a specially designed treatment system which provides compression therapy and cooling effects at the same time. We use this system both in our orthpaedic clinic and also in the field when we are providing medical coverage for sports events. This system is used by many elite sports teams in the US (eg. the NFL teams). Our orthopaedic specialists use it for both acute injuries and also in our post-operation patients to reduce pain and swelling, thus getting you back on the road to recovery quicker. The specially designed wraps can provide treatment for knee pain, ankle problems, elbow issues and shoulder injuries. 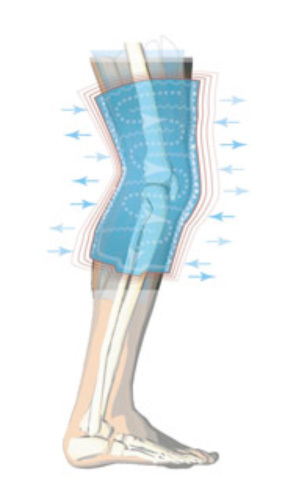 Cold and compression therapy is used in a variety of situations to reduce swelling, prevent oedema, and help promote blood flow to injured areas. All of these benefits contribute to less pain, faster healing, and a quicker recovery process. When Do We Use Cold and Compression Therapy ? Surgery recovery – Surgical incisions and other damaged tissues take time to heal. Adding cold and compression to the recovery process can help your body heal more quickly. Active compression stimulates healing and increases blood flow, while consistent cold helps reduce inflammation and pain. Injury recovery – Sprains, strains, fractures, and other athletic injuries that take you out of commission are part of being active, but they don’t have to slow you down for so long. Sports injury treatment can include using active cold and compression will allow you to get back to daily activities and sports more quickly. Specialized wraps that are designed for shoulders, wrists, ankles, elbows, knees, hands, hips, and backs ensure full coverage for the injured area. Acute Pain – You don’t need to be an athlete or recovering from surgery to experience pain. Active cold and compression can help relieve pain so you can take fewer medications and be more comfortable.